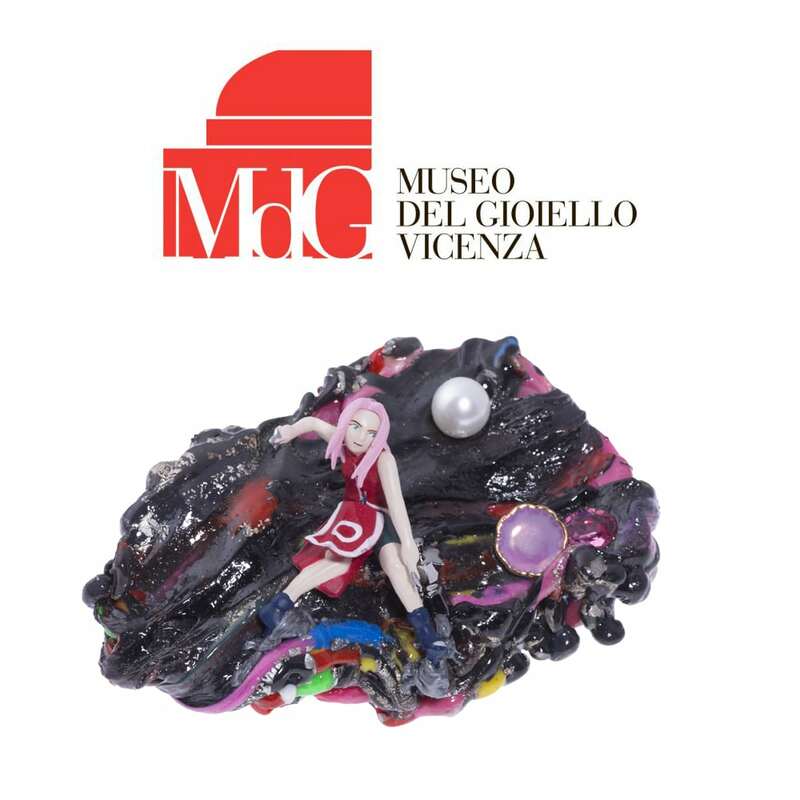 BLOB RINGS AT THE MUSEUM: some rings and a brooch from the BLOB collection will be exhibited in the design room of the Jewellery Museum for the third edition, by which the splendid Museum of Vicenza will renew its collection for the two-year period 2018-2020. Vicenza’s Museo del Gioiello jewellery museum, promoted by Italian Exhibition Group Spa in partnership with Vicenza Municipality, is inaugurating its third biennial on 14th December 2018 with an entirely new selection. The new approach that the Museo del Gioiello offers interprets jewellery according to profoundly different values, aesthetics and content, making it one of a kind in the world. The exhibition itinerary winds through 9 rooms, each containing a different meaning of jewellery, in a gathering of content, eras, geographies and origins. Jewellery defined as Symbol, Magic, Function, Beauty, Art, Fashion, Design, Icon and Future, each, in the new edition, entrusted to an internationally famous curator who has interpreted the meaning through extraordinarily beautiful and priceless items of jewellery. Pascale Lepeu – Director of the Cartier collection for over 30 years – selected the items for the SYMBOL ROOM where extraordinary jewellery illustrates the symbolic power of ornaments. Symbols of power, wealth, religion, royalty, manufacture: the room offers a varied vision of jewellery and its many roles through time. The MAGIC ROOM is entrusted to Cristina Boschetti – archaeologist and expert in artistic productions in the Hellenistic and Roman Mediterranean: protective amulets and talismans, jewellery with propitiatory powers to ward off evil influences. A variety of objects made of very different poor or precious materials, that allude to superior powers and timeless values. Going through the room is an intense and suggestive experience. For the FUNCTION ROOM, Massimo Vidale – professor of Archaeology at Padua University – decided to focus on the communicative function of jewellery. From seals, the jewellery of warriors from different cultures, to the rings and pendants used by rappers, elements that help to build and transmit the identity of the person wearing them. The BEAUTY ROOM contains an interpretation by Patrizia di Carrobio – a diamond expert in New York. In her opinion, jewellery transfers beauty to those who admire it. The theme is play with a fascinating blend of values where high and fashion jewellery intermingle. Marie-José van den Hout – the famous Dutch gallery manager, founder of the Marzee, the world’s largest independent gallery – is in charge of the ART ROOM. The theme is gold and the story unravels through the experimentation processes of international artists who were not afraid to take creativity and experimentation to the limit, achieving surprising results. In the FASHION ROOM, curated by Chichi Meroni, creative soul of the Arabesque Cult Store in Milan – an important wunderkammer of costume jewelry, fashion and mid-century design – the visitor is taken on a journey in which, letting himself be carried by the jewelry created for fashion between the 20’s and 80’s, will touch nine “islands” in the history of “bijoux de couture” and its link with the seven major arts that in this room are finally welcoming also fashion and design. Alba Cappellieri herself is the curator of the DESIGN ROOM. Her selection is dedicated to “designers without design”, in other words, to those designers that have never explored any other product than jewellery. It is an interpretation that takes jewellery designers, who are also artisans and authors, back into the design hive that has ignored them for too long and shows us the permeability and transverse nature of jewellery design. The ICON ROOM is under the curatorship of Gabriele and Emanuele Pennisi, top jewellers and antique dealers from Milan, who specialize in antique jewellery. This selection dedicated to Europe contains masterpieces from the past dating from the 17th to the 20th centuries, icons of their times: from the extraordinary mountings of the 1800s to the exquisite workmanship of jewels in enamel and from seals to portraits of famous people.